Alan Chircop, artistic director of the European Foundation for the Support of Culture and of the on-going VI Malta International Music Festival organised by the Foundation, welcomed members present and presented violist David Aaron Carpenter, soloist for the day, conductor Sergey Stadler who will be on the podium during the evening’s concert, Alexey Shor, composer in residence of the Foundation for the current year whose cycle for viola and orchestra is the main feature in the evening’s concert and Anna Ter-Hovakimyan, director, of the Armenian State Symphony Orchestra. 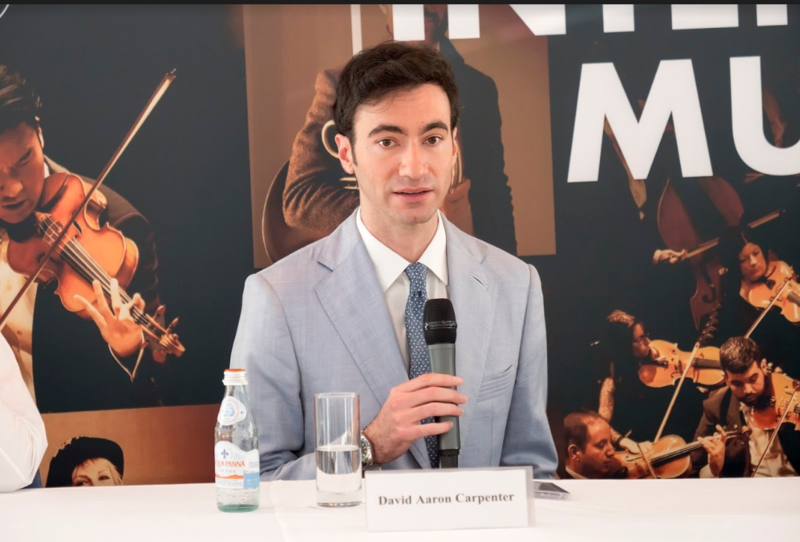 This was followed by a video presentation of David Aaron Carpenter in concert, a short presentation that was enough to give a taste of the warm beautiful tone of this American performer. It was Carpenter’ second visit to Malta. Last year he had come with his string ensemble to give a concert at the Russian Cultural Centre in Valletta during which he had performed the original version of Shor’s composition based on Murka, a Russian folk tale. Carpenter continued performing the work as an encore during his concerts and the success of the work prompted the composer to develop it into a cycle of 13 variations for viola and full orchestra which was being performed in the evening. Asked whether the change from performing with an ensemble to performing with a full orchestra affected his interpretation of the work Carpenter said that while the spirit of the music remained the same, it was obvious that he had to re-think a number of things in his performance apart from the fact that the work now includes a lot of new music. The day of the concert also coincided with the launch of a CD featuring David Carpenter as soloist with the London Philharmonic orchestra performing an arrangement of Dvorak’s Cello Concerto for viola and orchestra by J. Vieland and Carpenter himself, the unfinished Concerto for viola and orchestra by Bela Bartok, completed by Serly, Walton’s Concerto for viola and orchestra, and three works for viola and orchestra by Shor: Seascapes, Two songs for my Children and Well Tempered Chanson, which is the title he gave to the extended version of the original Murka composition. Shor said that he felt very proud to be in the same company as these eminent composers. Conducting the LPO are David Parry, Kazushi Ono and Vladimir Jurowski. Asked how the choice of composers for the CD came about Carpenter said that it was the fact that all four composers were living in a different city but writing about their homeland . Hence the name given to the CD “Motherland”. The production of the CD had been Carpenter’s idea who had originally wanted to show-case the viola by putting together all the pieces – about 50 – that Shor had written specifically for him. He noted that the repertoire for viola solo was very limited and he was grateful to Shor, with whom he was linked with close ties of friendship, for having written so much wonderful music specifically for the viola. The composition of the Murka cycle had started as a joke among friends and originally consisted of only one piece. Eventually it had grown into a cycle of thirteen pieces in which, according to Carpenter, Shor explored the most beautiful themes and melodies found in dances that came from the Russian tradition. For Carpenter it is great music which is a lot of fun to play, although technically it is unbelievably difficult . The music has a strong humorous element. Asked whether he was planning to compose any more works in this vein and whether he planned to write a cycle for violin and orchestra Shor answered that to date he has no such plans though he does not exclude anything. Asked if by using the phrase “Well Tempered” in the title he wanted to make any reference to Bach, Shor said that though there was some of the spirit of Bach in the music there was no specific reference to the composer. Anna Ter-Hovakimyanh said that the Armenian orchestra was familiar with the music of Alexei Shor that it had started to perform a few years back with great success. 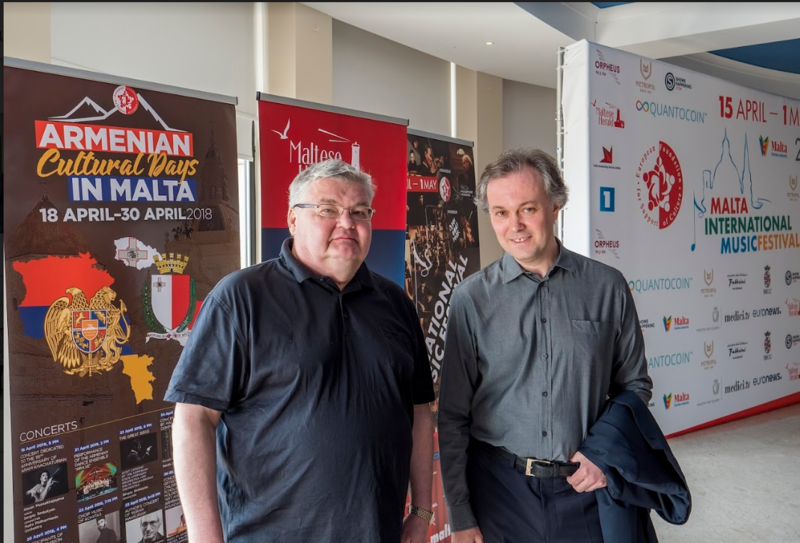 As to the reaction of Maltese people to Russian music Alan Chircop said that a “themes” concert organised last year by the Foundation had show a lot of interest among the Maltese to learn about Russian music. He found it very interesting to see that even today there are composers who are going back to popular themes and expressing them in a classical form. For conductor Sergey Stadler it was the first time he was conducting the Armenian orchestra and he found them to be a very professional group. To round up the conference Alan Chircop informed the audience that Tchaikovsky’s Suite from his ballet “The Sleeping Beauty” was also being performed during the concert. He once again congratulated Carpenter and Shor on the launch of the CD and invited everybody present to the next day’s briefing.